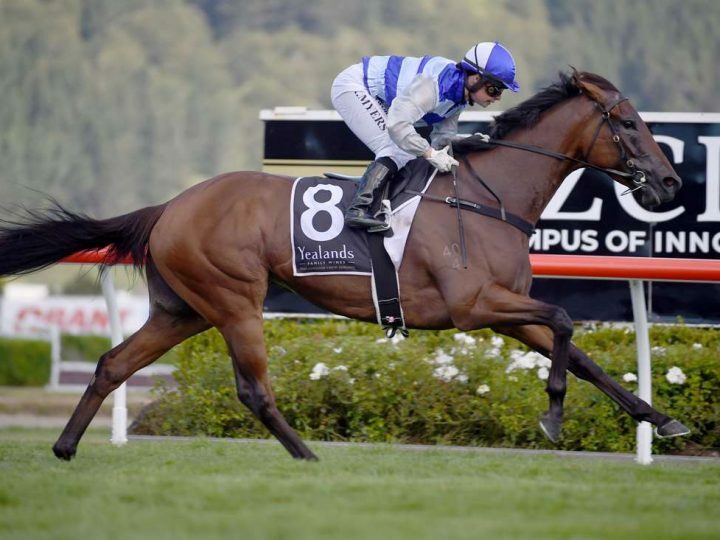 Promising mare Supera added some significant value to any potential broodmare career she may have, when she captured her first black-type success in Saturday’s Gr.3 Tui-Backing A Winner Since 1889 Anniversary Handicap (1600m) at Trentham. The royally-bred Savabeel four-year-old had produced a career-best effort when finishing third in the Gr.2 Cal Isuzu Stakes (1600m) back in December but bettered that result with Saturday’s victory. Rider Rosie Myers had Supera travelling nicely throughout the race but a clear margin off a hot speed set up by the flying Cambridge visitor Ugo Foscolo. Myers picked a path hard up against the rail in the home straight as Supera dashed past her rivals in the closing stages to score by two lengths from the well favoured Wyndspelle, who stormed home out wide. “I sort of looked at the jockeys around me and I didn’t think they were going to give me much room, so I stayed on the inside,” Myers said. “I hoped for a bit of luck and luckily I had the horse underneath me. Co-trainer Mark Donoghue, who prepares the Supera in partnership with Ken and Bev Kelso at Matamata, acknowledged the stable had high hopes before a race that held plenty of importance for the mare’s future breeding prospects. “It looks great (the win) on her (pedigree) page. Supera was bred by her owner Sir Peter Vela under his Pencarrow Thoroughbreds banner and is a half-sister to dual Group Three winner Eleonora who finished third in the 2016 Gr.1 VRC Oaks (2500m) at Flemington. Her dam Sopra Tutto is a daughter of Vela’s outstanding racemare Ethereal who won four times at Group One level including the 2001 Caulfield Cup (2400m)/Melbourne Cup (3200m) double. – NZ Racing Desk.